1. Preheat the oven to 200°C, gas mark 6. Cook the rice in boiling water for 30-35 minutes, or until tender. Drain. 2. Meanwhile, place the salmon in a small roasting tin, mix together the cajun seasoning, maple syrup and 3 tbsp water. Pour over the salmon and bake for 20 minutes. 3. 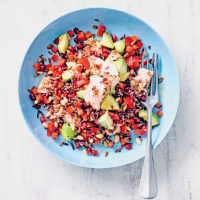 Mix the pepper, pomegranate seeds, pine nuts and avocado into the rice. Remove the skin from the salmon and flake into the rice. Whisk the vinegar into the salmon juices, pour over the fish and toss well.